The San Remo conference was an international meeting of the post-World War I Allied Supreme Council, held at Villa Devachan in Sanremo, Italy, from 19 to 26 April 1920. It was attended by the four Principal Allied Powers of World War I who were represented by the prime ministers of Britain (David Lloyd George), France (Alexandre Millerand) and Italy (Francesco Nitti) and by Japan's Ambassador K. Matsui. Resolutions passed at this conference determined the allocation of Class "A" League of Nations mandates for administration of the partitioning of the Ottoman Empire territories in the Middle East. The precise boundaries of all territories were left unspecified, to "be determined by the Principal Allied Powers," and were not finalized until four years later. The conference decisions were embodied in the Treaty of Sèvres (Section VII, Art 94-97). As Turkey rejected this treaty, the conference's decisions with regard to the Palestine mandate were finally confirmed by the Council of the League of Nations on 24 July 1922. During the meetings of the Council of Four in 1919, British Prime Minister Lloyd George stated that the McMahon-Hussein Correspondence was the basis for the Sykes-Picot Agreement which proposed an independent Arab state or confederation of states. In July 1919 the parliament of Greater Syria had refused to acknowledge any right claimed by the French Government to any part of Syrian territory. On 30 September 1918 supporters of the Arab Revolt in Damascus declared a government loyal to Sharif Hussein, who had been declared "King of the Arabs" by religious leaders and other notables in Mecca. On 6 January 1920 the then Prince Faisal initialed an agreement with French Prime Minister Georges Clemenceau which acknowledged "the right of the Syrians to unite to govern themselves as an independent nation". A Pan-Syrian Congress, meeting in Damascus, had declared an independent state of Syria on 8 March 1920. The new state included Syria, Palestine, Lebanon and portions of northern Mesopotamia which had been set aside under the Sykes-Picot Agreement for an independent Arab state or confederation of states. Faisal was declared the head of state. At the same time Prince Zeid, Faisal's brother, was declared regent of Mesopotamia. The San Remo conference was hastily convened. It was attended by the prime ministers of Great Britain, France, and Italy, and representatives of Japan, Greece, and Belgium. Several issues were addressed: a peace treaty with Turkey, League of Nation mandates in the Middle East, Germany's obligations under the Versailles Peace Treaty of 1919, and the Allies' position on Soviet Russia. Great Britain and France agreed to recognize the provisional independence of Syria and Mesopotamia, while claiming mandates for their administration. Palestine was composed of the Ottoman administrative districts of southern Syria. Under international law, premature recognition of its independence would be a gross affront to the government of the newly declared parent state. It could have been construed as a belligerent act of intervention without any League of Nations sanction. For France, the San Remo decision meant that most of its claims in Syria were internationally recognized and relations with Faisal were now subject to French military and economic considerations. The ability of Great Britain to limit French action was also significantly diminished. France issued an ultimatum and intervened militarily at the Battle of Maysalun in June 1920, deposing the Arab government and removing King Faisal from Damascus in August 1920. In 1920, Great Britain appointed Herbert Samuel, 1st Viscount Samuel as high commissioner and established a mandatory government in Palestine that remained in power until 1948. Article 22 of the covenant was written two months before the signing of the peace treaty. It was not known at that time to which territories paragraphs 4, 5 and 6 would relate. The territories which came under the regime set up by this article were three former parts of the Ottoman Empire and seven former overseas possessions of Germany referred to in Part IV, Section I, of the treaty of peace. Those 10 territorial areas were originally administered under 15 mandates. The decisions of the San Remo conference confirmed the mandate allocations of the First Conference of London (February 1920). The San Remo Resolution adopted on 25 April 1920 incorporated the Balfour Declaration of 1917. It and Article 22 of the Covenant of the League of Nations were the basic documents upon which the British Mandate for Palestine was constructed. Under the Balfour Declaration, the British government had undertaken to favour the establishment of a Jewish national home in Palestine without prejudice to the civil and religious rights of existing non-Jewish communities in Palestine or the rights and political status enjoyed by Jews in any other country. Britain received the mandate for Palestine and Iraq; France gained control of Syria, including present-day Lebanon. Under the agreement, Great Britain granted France a 25 percent share of the oil production from Mosul, with the remainder going to Great Britain and France undertook to deliver oil to the Mediterranean. The draft peace agreement with Turkey signed at the conference became the basis for the 1920 Treaty of Sèvres. Germany was called upon to carry out its military and reparation obligations under the Versailles Treaty, and a resolution was adopted in favor of restoring trade with Russia. Asserting that not all parts of the Middle East were ready for full independence, mandates were established for the government of three territories: Syria and Lebanon, Mesopotamia (Iraq) and Palestine. In each case, one of the Allied Powers was assigned to implement the mandate until the territories in question could "stand alone." "Zionist Rejoicings. 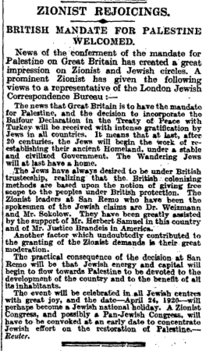 British Mandate For Palestine Welcomed", The Times, Monday, Apr 26, 1920, following conclusion of the conference. In 2010, a panel discussion was held in San Remo on the subject of the confernce's legal significance for the status of Israel and Jerusalem under international law. Panel participants included Deputy Speaker of the Knesset MK Danny Danon, Italian MP Fiamma Nirenstein and lawyer Jacques Gauthier of Toronto. At the 90th anniversary celebrations, Gauthier stated that the Jewish claim submitted to the world powers at San Remo was to be recognized as a people under the law of nations, to have the Jewish historical connection to what was then known as “Palestine” recognized; and to be granted the right to “reconstitute” Jewish historical rights in Palestine. While the Arabs also had claims on Ottoman territory, they were not specific to Palestine or Jerusalem.